Salisbury in King John, Act V Scene 2. Almost. Like a groggy bruin at this time of year, I’m beginning to revive from a bout of hibernation. I needed a break after all the shrew-taming last summer. Can’t produce at my old rate, and there were other demands on my time. If you’ve been loyal enough to check the site over the past few months (blessings upon you), you must be tired of seeing the pie-chart confetti banner that topped the last post. So here’s a quick, short, bannerless bit that will serve until I get something more substantial finished. You’ll have to bear with me. A while back, I received this tin of plasters as a prank. The other part of the joke is that my present post-existential state requires little in the way of first aid. But I realised that these bandages could be made useful, even motivational, for breathing, bleeding Oxfordians. All it takes is some legerdemainbrain. Of the fifteen plasters, six were duplicates. might not have been in the tin to start with. The trick is to turn the tables. These insults aren’t by Willy, they’re at him. You know bloody well he didn’t write them, so it’s a simple matter to make him their target, not their origin. The plasters bearing his mug are easy, he’s stuck right to you, attending your contempt. Those with the quill and inkpot make an obvious reference to the Shakspere Penmanship Question. 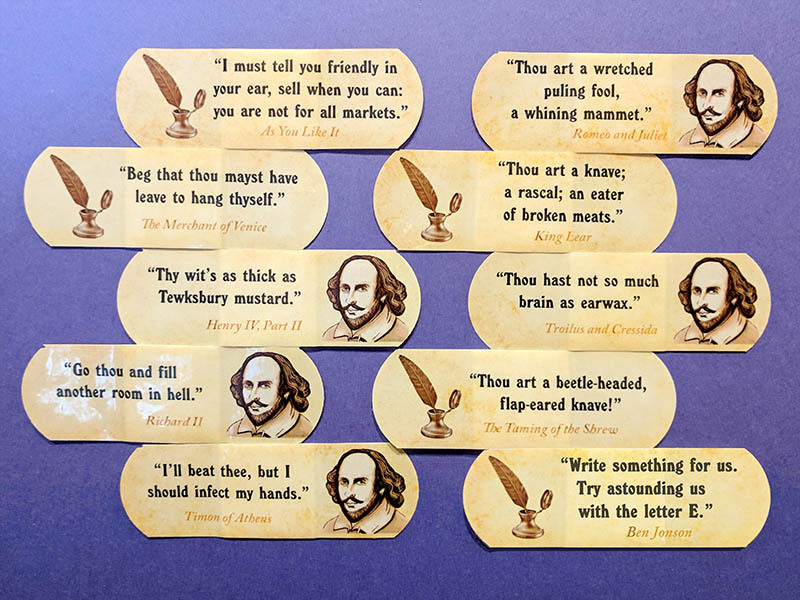 Posted on 25 March 2019 26 March 2019 by @edevere17Posted in Authorship (of Shakespeare), King John, Medicine, Shakespeare, The Winter's TaleTagged Animals, Anonymous (film), Bardolatry, Ben Jonson, Commerce, Handwriting, Shakespeare Industry.